Chong, W. P., van Panhuys, N., Chen, J., Silver, P. B., Jittayasothorn, Y., Mattapallil, M. J., Germain, R. N. and Caspi, R. R. (2015). NK-DC crosstalk controls the autopathogenic Th17 response through an innate IFN-gamma-IL-27 axis. J Exp Med 212(10): 1739-1752. Horai, R., Zarate-Blades, C. R., Dillenburg-Pilla, P., Chen, J., Kielczewski, J. L., Silver, P. B., Jittayasothorn, Y., Chan, C. C., Yamane, H., Honda, K. and Caspi, R. R. (2015). Microbiota-Dependent Activation of an Autoreactive T Cell Receptor Provokes Autoimmunity in an Immunologically Privileged Site. Immunity 43(2): 343-353. Mattapallil, M. J., Silver, P. B., Cortes, L. M., St Leger, A. J., Jittayasothorn, Y., Kielczewski, J. L., Moon, J. J., Chan, C. C. and Caspi, R. R. (2015). Characterization of a New Epitope of IRBP That Induces Moderate to Severe Uveoretinitis in Mice With H-2b Haplotype. Invest Ophthalmol Vis Sci 56(9): 5439-5449. Horai, R., Chong, W. P., Zhou, R., Chen, J., Silver, P. B., Agarwal, R. K. and Caspi, R. R. (2015). Spontaneous Ocular Autoimmunity in Mice Expressing a Transgenic T Cell Receptor Specific to Retina: A Tool to Dissect Mechanisms of Uveitis. Curr Mol Med 15(6): 511-516. Silver, P. B., Horai, R., Chen, J., Jittayasothorn, Y., Chan, C. C., Villasmil, R., Kesen, M. R. and Caspi, R. R. (2015). Retina-specific T regulatory cells bring about resolution and maintain remission of autoimmune uveitis. J Immunol 194(7): 3011-3019. Rodriguez-Pena, A. B., Gomez-Rodriguez, J., Kortum, R. L., Palmer, D. C., Yu, Z., Guittard, G. C., Wohlfert, E. A., Silver, P. B., Misplon, J. A., Sommers, C. L., Feigenbaum, L., Epstein, S. L., Caspi, R. R., Belkaid, Y., Restifo, N. P., Samelson, L. E. and Balagopalan, L. (2015). Enhanced T-cell activation and differentiation in lymphocytes from transgenic mice expressing ubiquitination-resistant 2KR LAT molecules. Gene Ther 22(10): 781-792. Chong, W. P., Horai, R., Mattapallil, M. J., Silver, P. B., Chen, J., Zhou, R., Sergeev, Y., Villasmil, R., Chan, C. C. and Caspi, R. R. (2014). IL-27p28 inhibits central nervous system autoimmunity by concurrently antagonizing Th1 and Th17 responses. J Autoimmun 50: 12-22. Horai, R., Silver, P. B., Chen, J., Agarwal, R. K., Chong, W. P., Jittayasothorn, Y., Mattapallil, M. J., Nguyen, S., Natarajan, K., Villasmil, R., Wang, P., Karabekian, Z., Lytton, S. D., Chan, C. C. and Caspi, R. R. (2013). Breakdown of immune privilege and spontaneous autoimmunity in mice expressing a transgenic T cell receptor specific for a retinal autoantigen. J Autoimmun 44: 21-33. Agarwal, R. K., Silver, P. B. and Caspi, R. R. (2012). Rodent models of experimental autoimmune uveitis. Methods Mol Biol 900: 443-469. Zhou, R., Horai, R., Silver, P. B., Mattapallil, M. J., Zarate-Blades, C. R., Chong, W. P., Chen, J., Rigden, R. C., Villasmil, R. and Caspi, R. R. (2012). The living eye "disarms" uncommitted autoreactive T cells by converting them to Foxp3(+) regulatory cells following local antigen recognition. J Immunol 188(4): 1742-1750. Bar-Yehuda, S., Luger, D., Ochaion, A., Cohen, S., Patokaa, R., Zozulya, G., Silver, P. B., de Morales, J. M., Caspi, R. R. and Fishman, P. (2011). Inhibition of experimental auto-immune uveitis by the A3 adenosine receptor agonist CF101. Int J Mol Med 28(5): 727-731. Mattapallil, M. J., Silver, P. B., Mattapallil, J. J., Horai, R., Karabekian, Z., McDowell, J. H., Chan, C. C., James, E. A., Kwok, W. W., Sen, H. N., Nussenblatt, R. B., David, C. S. and Caspi, R. R. (2011). Uveitis-associated epitopes of retinal antigens are pathogenic in the humanized mouse model of uveitis and identify autoaggressive T cells. J Immunol 187(4): 1977-1985. Fang, J., Fang, D., Silver, P. B., Wen, F., Li, B., Ren, X., Lin, Q., Caspi, R. R. and Su, S. B. (2010). The role of TLR2, TRL3, TRL4, and TRL9 signaling in the pathogenesis of autoimmune disease in a retinal autoimmunity model. Invest Ophthalmol Vis Sci 51(6): 3092-3099. Tang, J., Zhou, R., Luger, D., Zhu, W., Silver, P. B., Grajewski, R. S., Su, S. B., Chan, C. C., Adorini, L. and Caspi, R. R. (2009). Calcitriol suppresses antiretinal autoimmunity through inhibitory effects on the Th17 effector response. J Immunol 182(8): 4624-4632. Grajewski, R. S., Hansen, A. M., Agarwal, R. K., Kronenberg, M., Sidobre, S., Su, S. B., Silver, P. B., Tsuji, M., Franck, R. W., Lawton, A. P., Chan, C. C. and Caspi, R. R. (2008). Activation of invariant NKT cells ameliorates experimental ocular autoimmunity by a mechanism involving innate IFN-gamma production and dampening of the adaptive Th1 and Th17 responses. J Immunol 181(7): 4791-4797. Cortes, L. M., Avichezer, D., Silver, P. B., Luger, D., Mattapallil, M. J., Chan, C. C. and Caspi, R. R. (2008). Inhibitory peptide analogs derived from a major uveitogenic epitope protect from antiretinal autoimmunity by inducing type 2 and regulatory T cells. J Leukoc Biol 84(2): 577-585. Mattapallil, M. J., Sahin, A., Silver, P. B., Sun, S. H., Chan, C. C., Remmers, E. F., Hejtmancik, J. F. and Caspi, R. R. (2008). Common genetic determinants of uveitis shared with other autoimmune disorders. J Immunol 180(10): 6751-6759. Cortes, L. M., Mattapallil, M. J., Silver, P. B., Donoso, L. A., Liou, G. I., Zhu, W., Chan, C. C. and Caspi, R. R. (2008). Repertoire analysis and new pathogenic epitopes of IRBP in C57BL/6 (H-2b) and B10.RIII (H-2r) mice. Invest Ophthalmol Vis Sci 49(5): 1946-1956. Caspi, R. R., Silver, P. B., Luger, D., Tang, J., Cortes, L. M., Pennesi, G., Mattapallil, M. J. and Chan, C. C. (2008). Mouse models of experimental autoimmune uveitis. Ophthalmic Res 40(3-4): 169-174. Luger, D., Silver, P. B., Tang, J., Cua, D., Chen, Z., Iwakura, Y., Bowman, E. P., Sgambellone, N. M., Chan, C. C. and Caspi, R. R. (2008). Either a Th17 or a Th1 effector response can drive autoimmunity: conditions of disease induction affect dominant effector category. J Exp Med 205(4): 799-810. Agarwal, R. K., Horai, R., Viley, A. M., Silver, P. B., Grajewski, R. S., Su, S. B., Yazdani, A. T., Zhu, W., Kronenberg, M., Murray, P. J., Rutschman, R. L., Chan, C. C. and Caspi, R. R. (2008). Abrogation of anti-retinal autoimmunity in IL-10 transgenic mice due to reduced T cell priming and inhibition of disease effector mechanisms. J Immunol 180(8): 5423-5429. Silver, P. B., Agarwal, R. K., Su, S. B., Suffia, I., Grajewski, R. S., Luger, D., Chan, C. C., Mahdi, R. M., Nickerson, J. M. and Caspi, R. R. (2007). Hydrodynamic vaccination with DNA encoding an immunologically privileged retinal antigen protects from autoimmunity through induction of regulatory T cells. J Immunol 179(8): 5146-5158. Su, S. B., Grajewski, R. S., Luger, D., Agarwal, R. K., Silver, P. B., Tang, J., Tuo, J., Chan, C. C. and Caspi, R. R. (2007). Altered chemokine profile associated with exacerbated autoimmune pathology under conditions of genetic interferon-gamma deficiency. Invest Ophthalmol Vis Sci 48(10): 4616-4625. Tang, J., Zhu, W., Silver, P. B., Su, S. B., Chan, C. C. and Caspi, R. R. (2007). Autoimmune uveitis elicited with antigen-pulsed dendritic cells has a distinct clinical signature and is driven by unique effector mechanisms: initial encounter with autoantigen defines disease phenotype. J Immunol 178(9): 5578-5587. Grajewski, R. S., Silver, P. B., Agarwal, R. K., Su, S. B., Chan, C. C., Liou, G. I. and Caspi, R. R. (2006). Endogenous IRBP can be dispensable for generation of natural CD4+CD25+ regulatory T cells that protect from IRBP-induced retinal autoimmunity. J Exp Med 203(4): 851-856. Su, S. B., Silver, P. B., Grajewski, R. S., Agarwal, R. K., Tang, J., Chan, C. C. and Caspi, R. R. (2005). Essential role of the MyD88 pathway, but nonessential roles of TLRs 2, 4, and 9, in the adjuvant effect promoting Th1-mediated autoimmunity. J Immunol 175(10): 6303-6310. Karabekian, Z., Lytton, S. D., Silver, P. B., Sergeev, Y. V., Schneck, J. P. and Caspi, R. R. (2005). Antigen/MHC class II/Ig dimers for study of uveitogenic T cells: IRBP p161-180 presented by both IA and IE molecules. Invest Ophthalmol Vis Sci 46(10): 3769-3776. Bagenstose, L. M., Agarwal, R. K., Silver, P. B., Harlan, D. M., Hoffmann, S. C., Kampen, R. L., Chan, C. C. and Caspi, R. R. (2005). 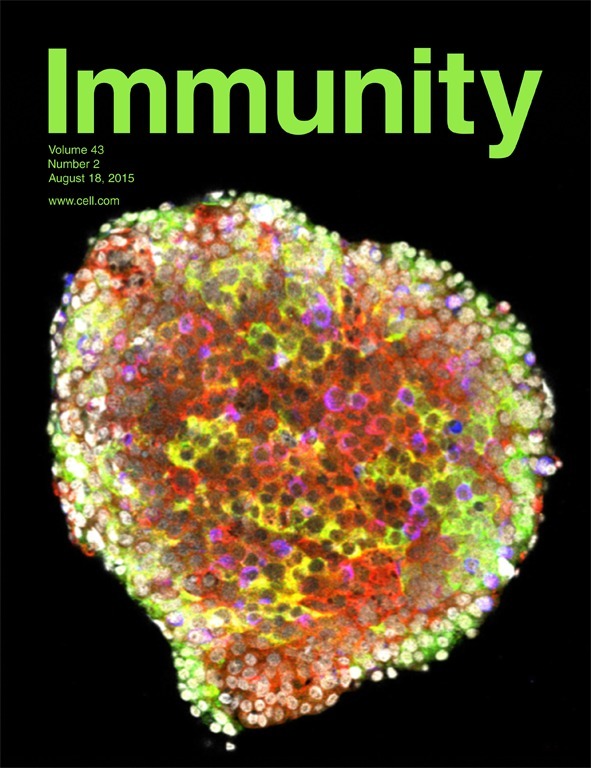 Disruption of CD40/CD40-ligand interactions in a retinal autoimmunity model results in protection without tolerance. J Immunol 175(1): 124-130.